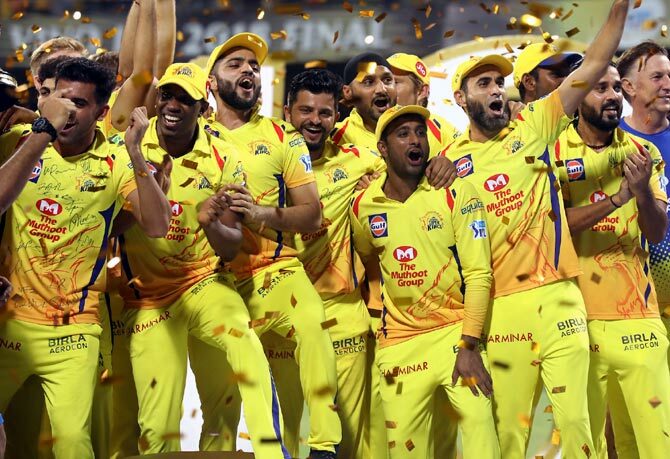 The Chennai Super Kings marked their return to the Indian Premier League after a two-year ban in grand style by winning their third title, getting the better of the Sunrisers Hyderabad in the final. Mahendra Singh Dhoni's 'Dad's Army' who were written off at the start of the tournament, exceeded all expectations with a consistent showing throughout, with their experienced players standing up at crucial junctures. Chennai's batsmen tallied the highest in the tournament with 2,809 runs from 16 games, with a run per wicket average of 36.48, with runners up Sunrisers Hyderabad a close second. Sunrisers took the honours in the bowling department, picking up 105 wickets in 17 games, while no other team went past the 100-run mark. Kolkata Knight Riders led the boundaries hit count with a tally of 361 boundaries (including 226 fours and 135 sixes), but also topped the boundaries conceded list, having given a total of 383 boundaries (253 fours and 130 sixes). The all-powerful KKR batting line-up registered the highest total in IPL-11, amassing 245/6 against the Kings XI Punjab in Indore. The Mumbai Indians finished with the lowest total in IPL-11 when they crashed for a lowly 87 against the Sunrisers Hyderabad who were defending 119 in a rare low-scoring contest at the Wankhede stadium. The Kings XI Punjab were the only other team to post below the 100-run mark, whey they were bundled out for 88 by the Royal Challengers Bangalore in Indore. The Mumbai Indians registered the biggest margin of victory by runs when they crushed KKR by 102 runs in Kolkata. RCB posted the biggest win in terms of wickets when they crushed Kings XI Punjab by 10 wickets in Indore. The Delhi Daredevils's batting sensation Rishabh Pant, who took the IPL by storm with his swashbuckling batting, registered the highest score in the tournament when he hammered 128 not out from 63 balls. CSK's Shane Watson was the only batsman to hit two centuries in the tournament, including the match-winning innings of 117 not out in the final against the Sunrisers. Sunrisers Skipper Kane Williamson took the Orange Cap as he finished as the highest run scorer in the tournament with 735 runs in 17 matches at an average of 52, with eight half-centuries. Rishabh Pant, K L Rahul and Ambati Rayudu all crossed the 600 run mark. Kings XI Punjab's K L Rahul registered the fastest half-century in IPL-11 from just 14 balls against the Delhi Daredevils in Mohali, while KKR's Sunil Narine slammed a 17-ball 50 against RCB. Shane Watson smashed the two fastest centuries. Both tons interestingly came from just 51 balls against the Rajasthan Royals and the Sunrisers. Rishabh Pant bagged the record for the most sixes in the tournament with a tally of 37 maximums, closely followed by Shane Watson, who fell two short. Kings XI Punjab pacer Ankit Rajpoot registered the best figures in the tournament as he picked up 5/14 against the Sunrisers, the only bowler to bag a five-wicket haul in the tournament. His Punjab team mate Andrew Tye bagged four-wicket hauls three times in the league. Not suprising, the consistent Andrew Tye finished as the top wicket-taker with 24 wickets from 14 games at an average of 18, while Sunrisers' spin wizard Rashid Khan claimed 21 wickets in 17 games the same as his team-mate Siddarth Kaul. Rajasthan leg-spinner Ish Sodhi had the most economical figures in IPL-11, conceding below six runs per over, during the six games he played. The impressive Lungi Ngidi shone with the ball in his first IPL for CSK, picking up 11 wickets at an economy rate of six. Sunil Narine showed his superb all-round skills, scoring 357 runs and picking up 17 wickets in 16 games, while his KKR team mate Andre Russell also did well with both bat and ball. M S Dhoni leads the captaincy charts with 11 wins from 16 games for a win percentage of 68, while Kane Williamson is second with 58 percent. Guess who Sachin watched the IPL final with?